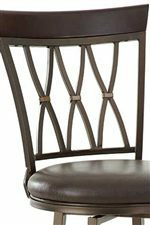 Capture the spirit of a refined island resort with the backless swivel bar chair. 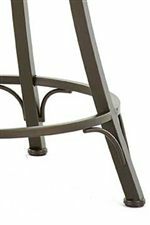 The simple piece features a welded base with splayed legs, circular stretchers, and curved reinforcements for a look that emanates bamboo or rattan.The seat features a heavy duty 360 degree swivel mechanism, with bonded leather upholstery over a foam cushion and decorative nailhead trim ensuring stylish comfort. Perfect for a counter breakfast area or a home bar, the backless swivel bar chair adds a touch of the tropics to any home. 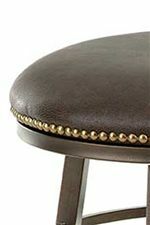 The Bali Backless Swivel Bar Stool with Nailhead Trim by Steve Silver at Walker's Furniture in the Spokane, Kennewick, Tri-Cities, Wenatchee, Coeur D’Alene, Yakima, Walla Walla, Umatilla, Moses Lake area. Product availability may vary. Contact us for the most current availability on this product.